Last year was marked by an active “flirting” of traditional banks with fintech. American banks are past “abruption” and “ignoring” phase – more and more they invest in startups, open APIs and their platforms for third-party developers. European players are still on a previous stage of market “probation” and strategy formation – they launch accelerators and hackathons and partner with others. Asian banks are more of announcing their grandiose plans (“too many innovation labs – too few innovations”), then implementing them – even Australian and African banks seem to be more pragmatic in comparison. Middle East banks are currently just eyeing the industry and have not been seen acting, as you can find in the new issue of “Money Of The Future 2016/2017” fintech report. Generally, all large banks are prone to make fuss over themselves at the start and then barely provide any information on their activities: it was an issue with the launch of the digital bank from Goldman Sachs in the beginning of April last year, followed by an autumn launch of their online-lending platform, and R3 banking blockchain consortium (are there any news concerning it besides information on another bank entry into and withdrawal from the consortium?) or a €200M venture fund from Unicredit, which has not given any updates since its launch. Vice versa, telcos became more active in fintech (and traditional insurance companies in insurtech too), than banks were in fintech at a similar stage. Banks’ area of interest is currently very limited. Most of deals and internal activities are focused on investments (online trading, robo-advisory, wealth management, personal financial managment), online lending and blockchain. In mobile remittances and e-wallets or online-banking their activities are more restrained. Among other interesting trends – launch of digital banks by big traditional players – GSbank from Goldman Sachs in USA, digibank (now in India, soon – in Indonesia) from Singaporean DBS, ACCESS OnlineSM (in Indonesia) from JP Morgan (their mobile banking solution has already reached the first place in USA in usage, overtaking platforms of Bank of America and Wells Fargo; they also appointed Alex Sion from Moven as a head of mobile business applications). Many segments and niches haven’t been exploited yet. Big potential lies in banks’ “openness” to collaboration with startups from any area, ability to engage with them vie open APIs and bank-as-a-service platforms. Barclays, Goldman Sachs, Citi, Santander and BBVA are leading the fintech show, however their investment approaches are different. While GS, Citi and Santander invest with the main target to get a direct return on investments, BBVA and Barclays make more strategic investments aiming to get both — financial return and value for core banking business. In 2016 top South-East Asian banks, considering global trends and experience, started to follow Chinese, Japanese, Korean megabanks with playing active role in fintech in Asia, to name a few: DBS, OCBC, UOB from Singapore; Maybank, CIMB, Hong Leong and RHB from Malaysia; Siam Commercial Bank and KasikornBank from Thailand, Mandiri from Indonesia and many others. SEA will be an interesting case to test fintechs and banks cooperation: in this region banks started to be active in fintech before the market was actually formed, meaning that they will have a significant influence on the future of the whole fintech industry and it’s intriguing how (and if) they will be able to manage it. An extensive interest was shown by banks and financial institutions partnering with robo-advisors and online wealth management services. In addition, there is a growing tendency by banks to partner with P2P- and P2B- lending companies (Santander, UOB, Belfius Bank, Alfa Bank, etc). Many pilots were initiated in 2016 between blockchain companies and banks worldwide. Considering the list of investments, it’s clear that most of banks are looking for strategic benefits for their core business, that is why most of investments are made into complimentary companies: those which product can be integrated into bank’s product line, and mainly used as a new digital channel for clients acquisition as well as better service and support. Several banks has already started to invest into fintech in order to diversify their core business and hedge their risks for the long-term play, without a target to integrate fintechs into existing banking business. Only one year ago Asian fintech was twice smaller than the US and 2016 became the first year when the US lost its dominant global leadership in the fintech. 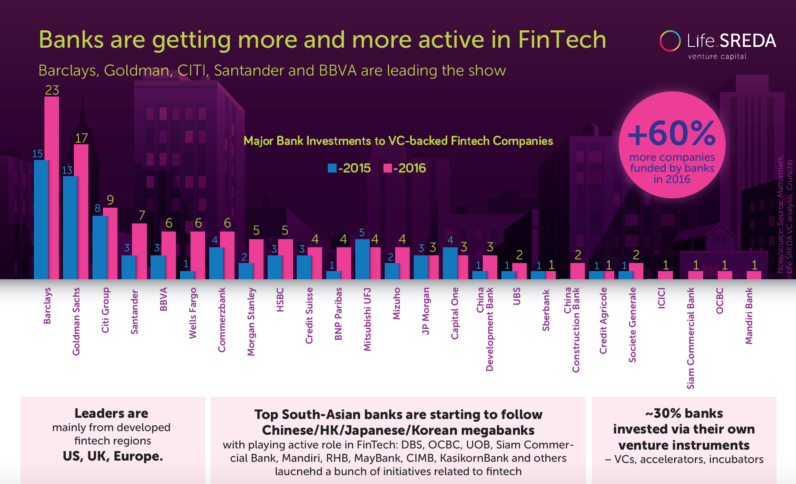 Maybe, because of central banks of Asia became the most active regulators in the fintech space globally: Singapore, Hong Kong, India, China, Malaysia, South Korea, Japan launched dozens of useful initiatives (licenses, guidelines, sandboxes, incentives, etc.) to help fintech industry to mature within the regulated environment. The US fintech market is quite mature and regulated, however several initiatives happen there as well, mainly aimed on shaping certain sectors within an industry (for example, crowdfunding). However the UK and Europe regulators are still the benchmark for the whole world: Open Banking Standard (BaaS and APIs), PSD2, new fintech licenses for neobanks are the most notable regulation changes in the global fintech industry. Overall trend towards active involvement of banks and regulators into fintech industry gives all other players, such as entrepreneurs, startups and investors, a clear sign that the industry is getting mature and sustainable, and can develop further as a stand-alone market, providing more opportunities for building new businesses with the support of government and existing incumbents on the market.